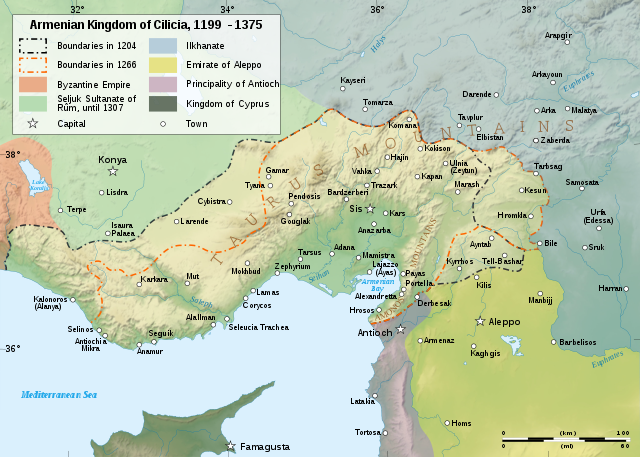 The accounts concerning four brothers who became Kings of Cilician Armenia towards the end of the 13th century tell a tale of murder, usurpation and treachery, but who betrayed who and when is far from clear from the Wikipedia pages. Cilician Armenia was a key ally of Christian crusaders but surrounded by Muslim states (see map below). The four brothers were Hethum II (reigned 1289–1293, 1295–1296, 1299–1303), Thoros III (reigned 1293 to 1296? ), Sempad (reigned 1296 to 1298) and Constantine I (reigned 1298 to 1299). Although it is clear that Hethum and Thoros were 'allies' and that Sempad was their 'enemy', the role of Constantine is unclear. 1296 Hethum and Thoros journey to Constantinople, apparently leaving Sempad as regent. 1296 Sempad usurps the throne with Constantine's help and imprisons his brothers upon their return. Hethum is then blinded while Thoros is killed. In 1299, Hethum, recovered at least partially from his blindness, ousted Constantine and once again resumed the crown. turned against him [Sempad] two years later in 1298 to restore his older brother Hethum II. He assumed the throne for a year while Hethum recovered from his imprisonment. Constantine turned traitor again and helped Hethum overthrow Sempad, assuming the throne while Hethum's blindness healed. In short, the first account basically says Constantine usurped the usurper (Sempad) as well as Hethum while the other two accounts imply Constantine was simply looking after the throne for Hethum. Also, the page on Constantine says nothing about him being a usurper while the page on Hethum clearly states that he was. As Hethum had already abdicated once (and was to do so again in 1303), the latter two accounts seem plausible. On the other hand, Constantine changed sides again in 1299 in an attempt to restore Sempad (it failed and they were imprisoned). Mack Chahin's book The Kingdom of Armenia: New Edition might clear this up but a key page is not available for viewing. Did Constantine rule as a usurper or was ruling legitimately in Hethum's place, with the latter's consent? Browse other questions tagged middle-ages monarchy armenia or ask your own question. Did anyone ever win a kingdom through single combat without a backing army or blood tie to the throne? Is this assessment of the damage caused to Azerbaijan during the Nagorno-Karabakh war accurate? A zoo during the rule of Omayyad or Abbasid dynasty? Why were women monarchs allowed to rule in patriarchal societies?